The classic Grand Hotel lives up to its name when it comes to charm and Scandinavian style. Built in 1892, the hotel has been lovingly maintained in an elegant, classic style boasting every modern amenity. 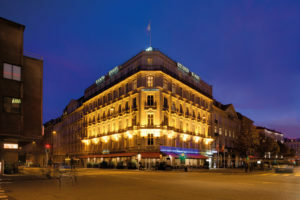 The Grand Hotel is ideally located at Vesterbrogade. Just a few minutes’ walk from the Town square, Tivoli Gardens and exciting museums & art galleries. The Standard Single room is 8 sq.m with a private bathroom. The room is equipped with a good bed (90 cm), a desk, flatscreen tv with local and international channels, as well as free WI-FI. The Superior Single room is 10 sq.m with a private bathroom. The room is equipped with a double bed (140 cm), a desk, flatscreen tv with local and international channels, as well as free WI-FI. The hotel offers you 15% discount off the daily flexible rates including breakfast. Prices change so we recommend that you reserve your room as soon as possible. 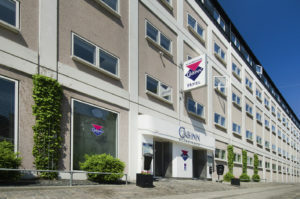 CABINN Scandinavia is located at Frederiksberg near the Lakes and the Metro station Forum; just 10 minutes’ walk from the city centre of Copenhagen with the Tivoli Gardens and the pedestrian street, Strøget. All 201 rooms have private bath with shower and toilet, television, small work desk, free Wi-Fi and electric kettle with tea and coffee. All standard rooms have bunk beds. The hotel has a breakfast restaurant and parking facilities (fees apply). Smoking is not allowed inside the hotel. Wake Up Copenhagen is a newly opened hotel. 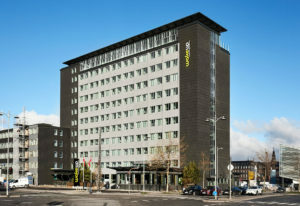 It is located on the corner of Bernstorffsgade and Kalvebod Brygge. Just a few minutes walk from the hotel is Tivoli Gardens, Copenhagen’s waterfront and lots of shops and restaurants. All 585 rooms have private bath with shower and toilet, television, air conditioning, a work desk and free Wi-Fi. The hotel has a breakfast restaurant and parking facilities. Smoking is not allowed inside the hotel.